NOTE: Keyed Functions require a 5-1/2" CC bore measurement. This means from the center of the thumbturn hole to the center of the door knob hole should measure 5-1/2"
Choose from many lever and knob styles and several finishes. Complete set. Includes knobs and backplates for both sides of the door, latch and strike plate and mounting hardware. Shipped with square corner mortise plates and strike plate. Rounded corner available upon request. **Not all knobs and levers are available in all finishes. Please see notes below. Arts & Crafts Levers, Hammered Levers and Hammered Knobs are not available in Polished Brass, French Antique, Polished Chrome, Flat Black or Pewter. Dog Knobs are not available in French Antique, Flat Black, Polished Chrome or Pewter. Victoria, Lancaster, Oval Beaded and Belmont knobs are not available in Flat Black, Polished Chrome or Pewter. Lafayette, Ribbon & Reed, Rope, Rustic, and Santa Fe Levers along with Rope and Ribbon & Reed Knobs are not available in Flat Black. - Shipped with Mortised tubular latch. - Choose between standard 2 3/8" or 2 3/4" backsets. Emtek covers its door hardware with a 5 yr finish and mechanical warranty. Living finishes are not covered under this warranty as they are designed to change over time. 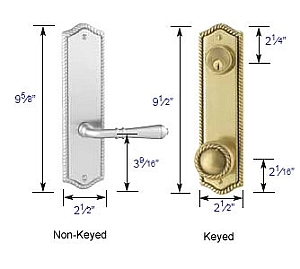 For more information see Emtek Door Hardware Warranty. Emtek products are assembled per order so when they are returned the doorknobs have to be taken apart and restocked. As a result, there is a 25% restock fee on all Emtek products. If items are returned that have been installed, used or abused there may be a higher restock fee assessed or no credit issued. If you need to return an item, please repack the door hardware in its original packaging to assure that it arrives undamaged. 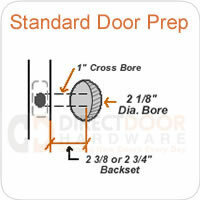 For more return information see our Direct Door Hardware Returns Page. Before returning any Emtek Door Hardware, please contact us for a return authorization number.